Kensington Palace is now most famous as the former home of Diana, Princess of Wales, but the palace's glory days came between 1714 and 1760, during the reigns of George I and II . In the eighteenth century, this palace was a world of skulduggery, intrigue, politicking, etiquette, wigs, and beauty spots, where fans whistled open like switchblades and unusual people were kept as curiosities. Lucy Worsley's The Courtiers charts the trajectory of the fantastically quarrelsome Hanovers and the last great gasp of British court life. Structured around the paintings of courtiers and servants that line the walls of the King's Staircase of Kensington Palaceâ€”paintings you can see at the palace todayâ€”The Courtiers goes behind closed doors to meet a pushy young painter, a maid of honor with a secret marriage, a vice chamberlain with many vices, a bedchamber woman with a violent husband, two aging royal mistresses, and many more. 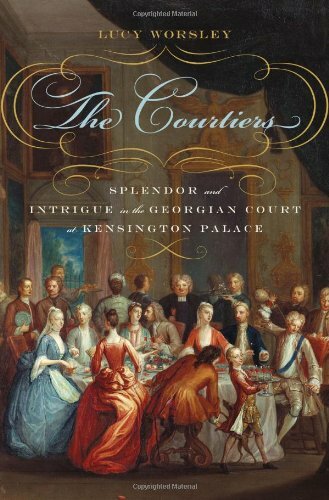 The result is an indelible portrait of court life leading up to the famous reign of George III , and a feast for both Anglophiles and lovers of history and royalty.